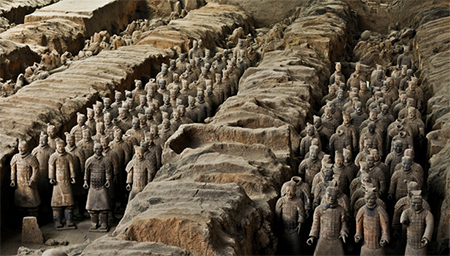 In life and in death, Chinese emperors in the past maintain huge armies. Historians chronicle the emperors’ lives, the wars, the conflicts, the struggles for power and the throne, their wealth, their lifestyles, traditions and more. Even if the writings are descriptive, it is still difficult to imagine the enormity and grandeur of their life and reign. The discovery of the terracotta army of China’s first emperor brings a more visual and descriptive showcase of how life was like then for them. He came to the throne when he was only 13 years old and by age 22, he gained full power to rule the nation. His name was Qin Shi Huang Di, the first emperor of unified China. His birth name was Ying Zheng and he was the son of the Qin state’s king. Even the unification of the various warring states was attributed to this man, who was credited for the construction of the Great Wall of China and in death, one of China’s greatest treasures, the Chinese Terracotta Army. The emperor’s astounding project was discovered in 1974. Farmers were digging a well when they uncovered some earthen figures near Xianyang, an old Chinese capital. It turned out to be a huge and elaborate funerary complex with different sections. In the past, many vassals’ lives were sacrificed when their rulers died, as they were buried together with their lords. But in this case, full sized clay figures were created to replace humans. The three pits that were excavated revealed a huge army, some 8,000 of them. It’s presumed that these warriors were created to protect their emperor even in the afterlife. There were also horses and wooden and bronze carriages adorned with pieces of pure gold and silver. The two bronze chariots were fully restored and put on exhibit. The statues were unlike anything else that have been discovered in China. They were created around the third century B.C. Historians, artists and archeologists wonder as to how the royal artists back then were able to have such a grand idea. The life-sized models were very detailed and faint traces of paint indicated that they were once painted with bright colors. What’s more astonishing is that each figure has a different facial expression. They were stationed according to rank, placed in rows in trenches in battle formation. Most were standing but there were also kneeling archers. Historians say that all the full sized clay figures, men and animals were all made by hand. It is estimated that around 700,000 laborers worked on creating the massive complex and the figures. It took them 40 years to complete the project. Researchers say that the arms, legs, hands, short tunics, hollow torsos and basic solid heads were molded separately and assembled later. More clay were added to the warriors’ heads so that the artists can individually model the hairdo and facial features. These clay figures were fired in a kiln to make them durable and hard before they were assembled and painted. Initially believed to be created in an assembly-line fashion, new research and technologies used to make detailed analyses determined that each clay figure and all the weapons were created individually, each one stamped with the date and name of the artisan. 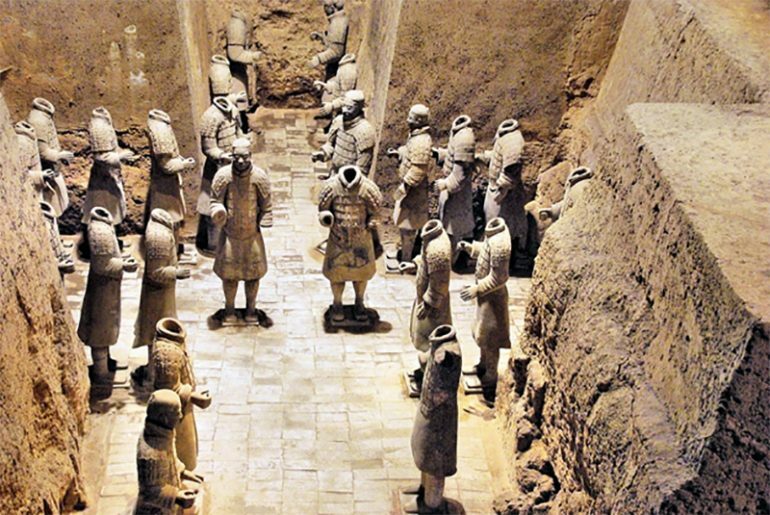 Further research and new discoveries provided scientists with additional clues on how the Terracotta Army was designed and created. Archeologists discovered bronze figures of cranes, swans and ducks as well as acrobats in one of the pits, created in the tradition of ancient Greek and Egyptian sculptures. There were also evidence of European DNA discovered in the Xinjiang region, which is close to where the Terracotta Army and Horses complex and the tomb of Emperor Qin Shi Huang Di are located. Therefore scientists came to the conclusion that foreign artists may have influenced the creation of the terracotta figures. According to historical records, there were sculptors from ancient Greece who traveled to China about 1,500 years before Marco Polo set foot on this Asian land. They were the first people from the West who came in contact with China before the Silk Road was formally opened. They are presumed to be the ones who trained Chinese craftsmen and probably helped in designing the army. Art historians say that during that time, China was not known to produce realistic and life size sculpture. There were also records that state that the Emperor had copies made of Greek sculptures, presumably brought in by Alexander the Great in the 4th century.